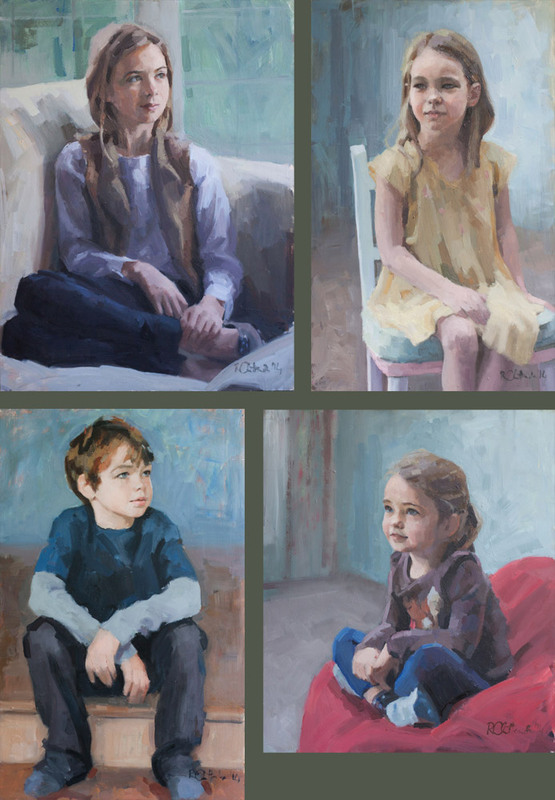 This is a family of four enchanting Irish children that I have just finished painting – 6 months of work. 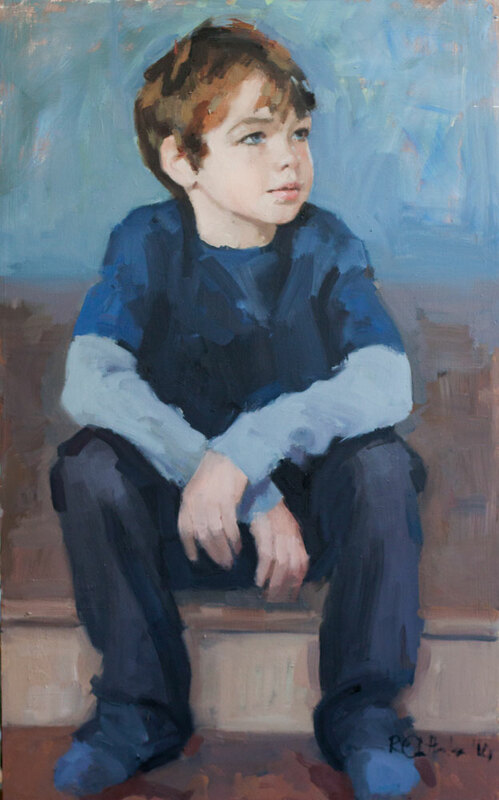 It was a very interesting and challenging commission with the children’s age ranging is from 11 down to 4 years old. 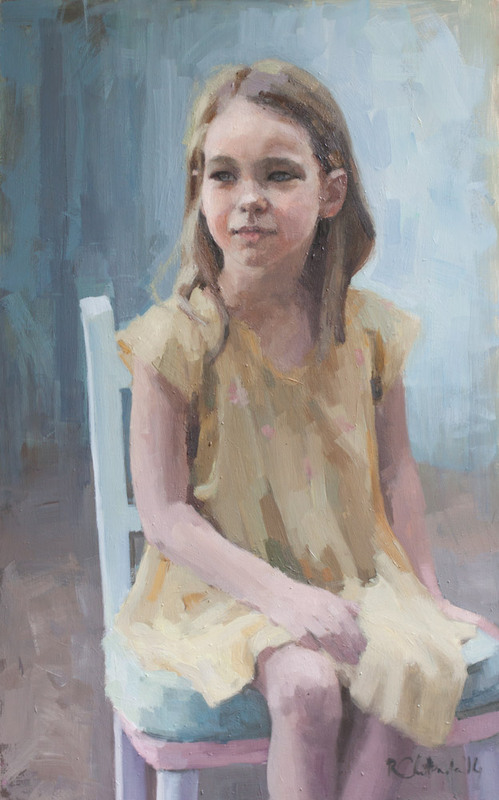 The challenge was to produce 4 individual oil portraits of these highly individual children that had cohesion as a set. Blessed with the perfect client, I was given carte blanche. Commissioned as a surprise for the mother’s birthday, (she was out of the house for the day), we had a lot to achieve in quite a short time. By the time I arrived at their house at 8am, (5.30am start from home), all four children were already dressed in their favourite outfits with very little input either from my client (their father) or from me, which meant that we were getting a true picture of them. There was nothing forced or contrived. Having viewed where the portraits would probably hang, I felt it was important that they occupied roughly the same surface area of canvas/board. This of course presents its own challenges as the age range is quite wide and therefore there is more to fit in with the older children. Aoife, the eldest is a bright, chatty, energetic pony-mad bookworm. 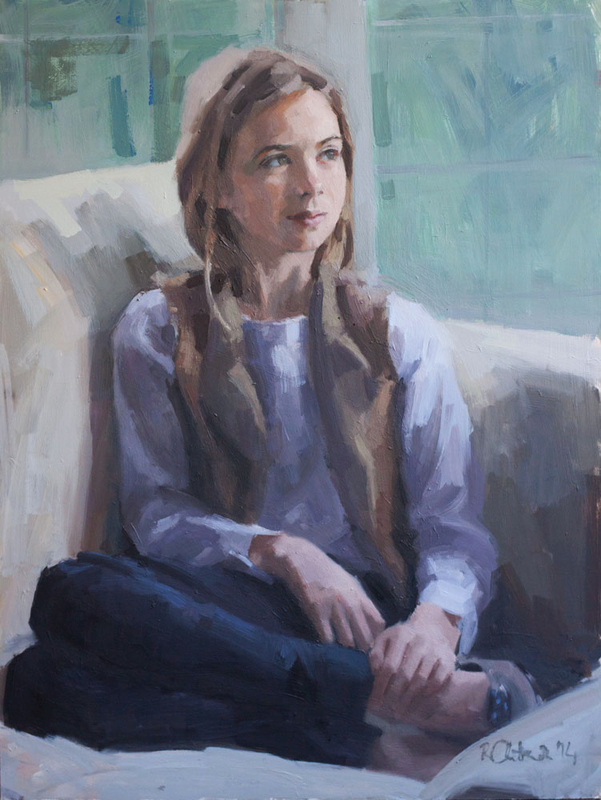 Ironically, for the tallest child, the pose that captured her was a full-body one which set the scale of the other portraits. Dreamy, easy-going and mellow, Carrick is the diplomat of the family. A charming boy, he was incredibly engaged in the whole photography session and seemed to know instantly what was needed. He became my assistant for the day, fetching chairs and props, helping to choose the best photos. Petite, elfin Isla is the Princess of the family. Pretty floaty dresses are the dish of the day. Sits very tall so this long thin format suits her very well. She has a lovely elfin face. Sadly you cannot see the sparkly nail varnish that she had put on specially for the occasion. The youngest of the four, Niamh is more of a tomboy. Lively, bright, mischievous and strong-minded. The pose that summed her up was this small triangular pose on her beanbag. This brought compositional problems as ideally her pose would have been longer/bigger to match up with her older siblings. But it didn’t make sense to force a pose just to suit the others, so I just had to make sure her personality filled the space. I think it does! 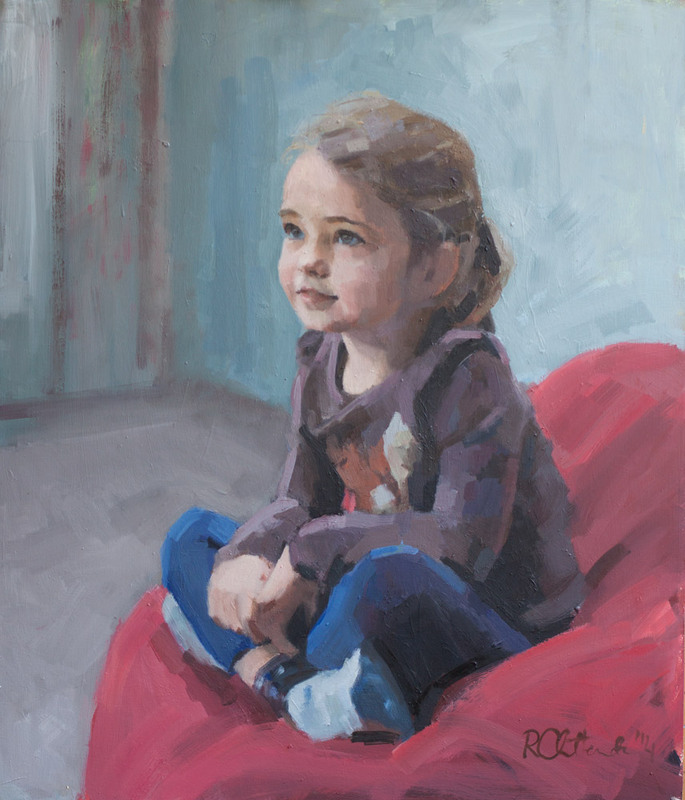 See here for more examples of my portraits of children. For more information about procedure and prices click here. Or contact me here.